because fashion designers don't give enough credit. The Oscars is the biggest award show all year, which means every person attending is dressed to the nines. It's not uncommon for a fashion designer to create a custom piece for a certain celebrity, so that they can get their name out there, but recently I've noticed that the designers are not given much credit. The celebrity really gets all the credit for what they're wearing, which like I said was probably specially designed for them, or a stylist picked it out. But it's not just the celebrity that doesn't give credit to their designer (in some cases), but also I've noticed a lot of fashion magazines, like Vogue, won't even give the name of the designer someone's wearing. 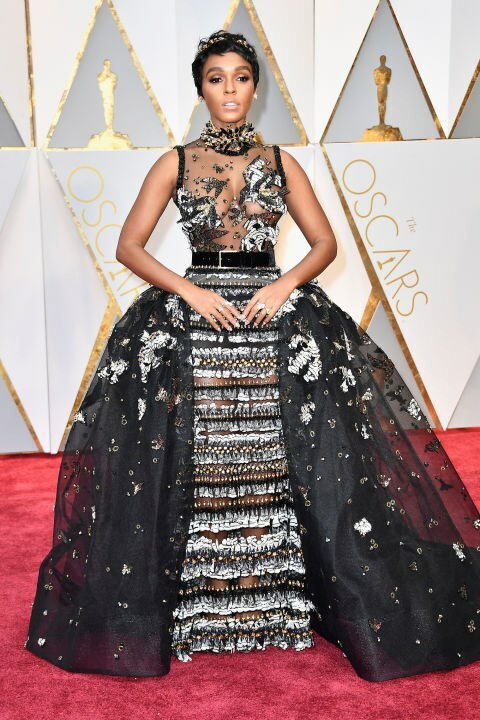 So, as a fashion design major and lover of all things couture, I've taken it upon myself to give credit and a shout out to all the amazing designers who had their pieces worn at The Oscars. Also shout out to Emma Stone for winning best actress for La La Land. Worn by Auli'i Cravalho. (She also killed her performance by the way). 10. Elie Saab Worn by Janelle Monae.